St. Augustine was one of the foremost philosopher-theologians of early Christianity and the leading figure in the church of North Africa. He had a profound influence on the development of Western thought and culture. His two most celebrated writings are his semi autobiographical Confessions and City of God, a Christian vision of history. 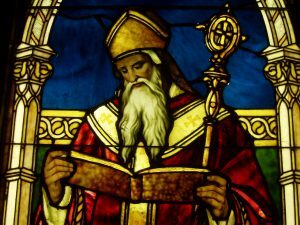 St. Augustine (354-430) was born and lived most of his life in the northern part of Africa, at that time, the Roman Province of Africa. 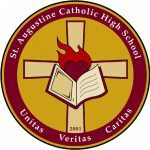 St. Augustine received the best education available then and later taught in the important cities of Carthage, Rome and Milan. His brilliance of learning and culture brought to him the honour of giving festive speeches both on the occasions of public celebration and at the cost of the emperor. He became a Christian at the age of 33 being converted by the prayers of his mother, St. Monica, and the help of St. Ambrose of Milan, who baptized him. Afterwards, St. Augustine began a life completely dedicated to the service of God. After his mother’s death, he returned to Africa in 388, sold his property, gave the proceeds to the poor, and founded a monastery. He was chosen and ordained a priest in 391, and consecrated Bishop of Hippo Rhegius, a coastal city of Northern Africa in 395. His later thinking can be summed up in a line from his writings: “Our hearts were made for You, O Lord, and they are restless until they rest in you”. His feast day is August 28th. Breather in me O Holy Spirit, that my thoughts may all be holy.